Buffalo Chicken Empanadas - buffalo chicken and cheddar baked in pie crusts - dip in some spicy ranch! These are SOOOO good!! They were the first thing to go at the party. Everyone raved about them!! Buffalo Chicken Dip is one of my all-time favorites. I am always looking for ways to change it up. 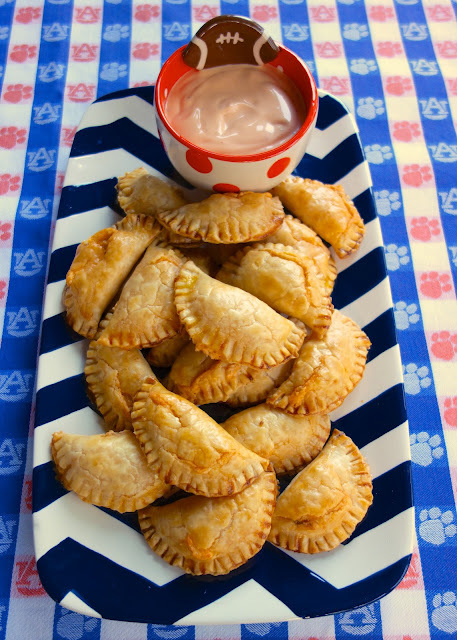 I recently made these Buffalo Chicken Empanadas and they were a huge hit! We actually liked them so much, that we ended up eating them again for lunch the week after the tailgate. I modified my favorite buffalo chicken dip and stuffed it into some pie crust. The empanadas were flaky and delicious. We dipped them into some spicy ranch dressing. They are easy to transport and great for tailgating. In a large bowl, combine cream cheese, chicken, cheese, ranch dressing and buffalo sauce. Set aside. Remove 1 pie crust from pouch; unroll on cutting board. With a rolling pin, roll out crust to about a 16-inch diameter. Cut 12 rounds from pie crust with a 2&1/2 to 3-inch round cutter. Repeat with remaining pie crusts. Top each pie crust round with 1-2 teaspoons of buffalo chicken. Moisten edges of dough with water; fold dough over and press with fingers to seal. Use fork to create design around edge. Place on cookie sheet. Repeat with remaining pie crust and filling. Brush tops lightly with egg. Bake 15-18 minutes or until golden brown. These sound amazing! I'll eat anything buffalo chicken! Going to try these with crescent roll dough, since I have them in the fridge. I'll let you know how they worked out!! 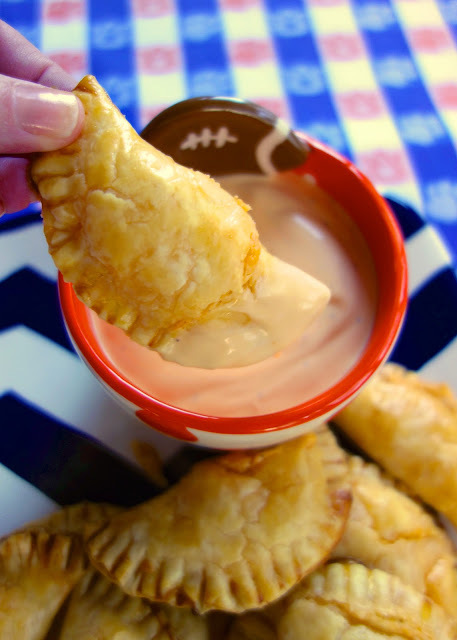 I'm making these tonight for tailgate tomorrow! War Eagle! how cute are those little guys? They even almost look like footballs. These look so good! What is the orange sauce?? Is there a recipe to the dipping sauce you used? It is just Ranch dressing with some hot sauce in it.